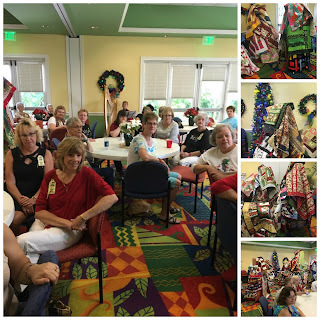 The Christmas Project began in 2010 when Mary Lou O’Phelan received a load of unfinished Christmas quilt blocks from Patty Bartkowski at the Cape Coral Quilt Guild. That year, 22 Christmas quilts were donated to Hope Hospice. The following year, many members of the Guild joined in, allowing the group to donate 57 Christmas quilts. In 2012 Mary Lou O’Phelan and Marcia Denning decided to start a Quilt Club at the Sandoval clubhouse, to meet once a week. That year, special kits were made for those who wanted to participate in the Christmas project. The Club donated a total of 76 quilts at a special luncheon event - which has since become a tradition of the Sandoval Quilt Club. 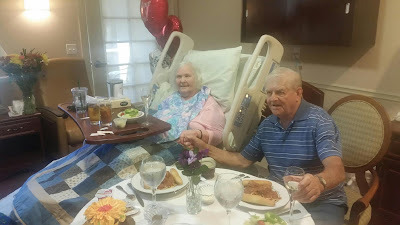 The group now meets twice a month to enjoy the process of quilting, and every year they are able to donate more quilts. This year, Sandoval Quilt Club members donated 120 Christmas quilts to be distributed to homebound Hope Hospice recipients. These quilts are made with love, and every member has contributed in some way to make the project a success. 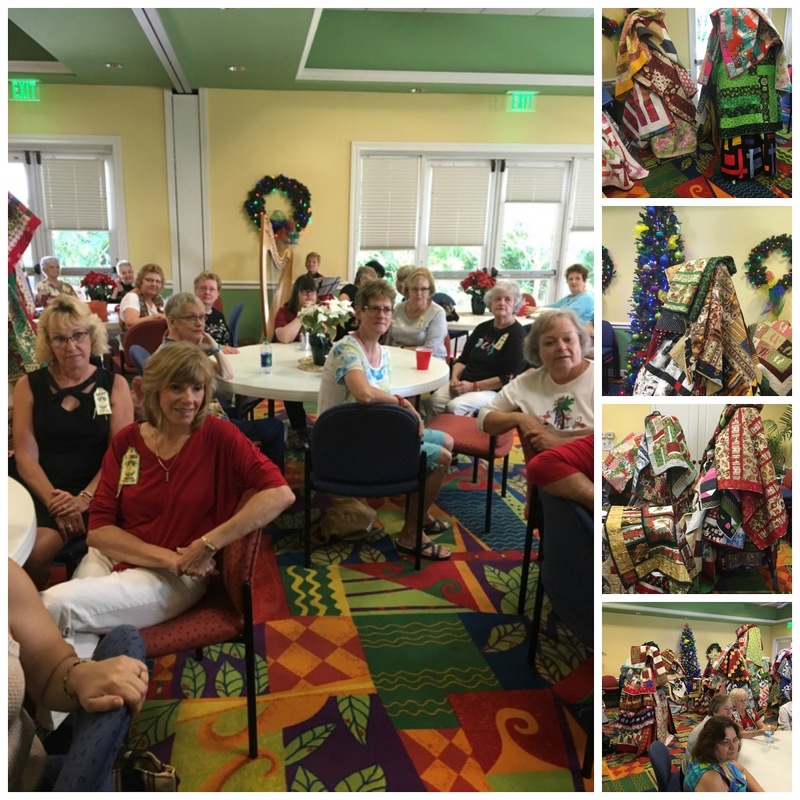 Others from the Cape Coral Quilt Guild have also contributed to the cause - resulting in a large number of quilts and a festive event! 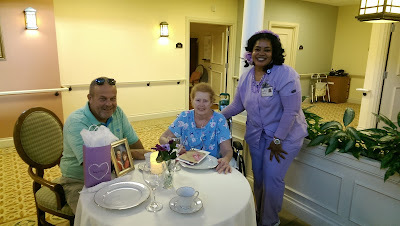 Special thanks also goes to volunteers Carol Rose, Mary Ann McCarthy, and Sandy Nelson for their effort and dedication. For more than 25 years, Hope has celebrated the spirit of the holidays with the Tree of Lights memorial. Placing an ornament on a twinkling tree in memory of a loved one has become a cherished family tradition for many. Over the years, people have shared that this simple act is their favorite way to honor those who have touched their lives. 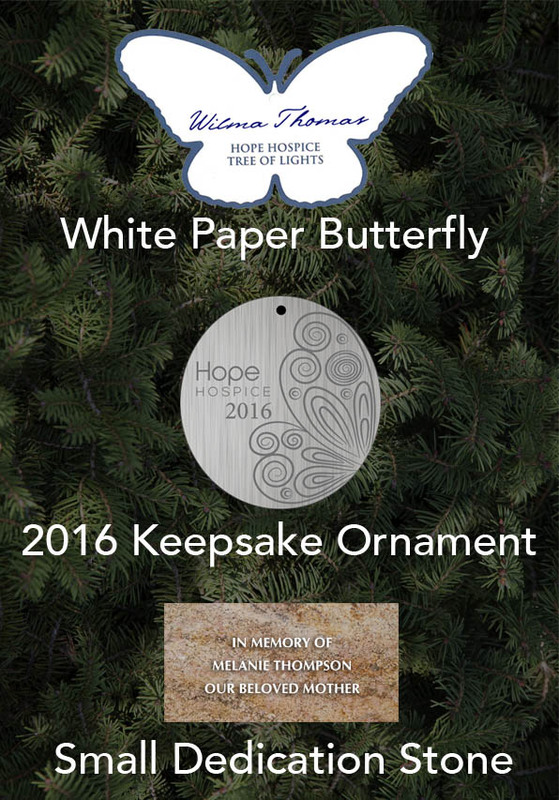 At each Hospice House, we have adorned the Tree of Lights with white paper butterflies featuring loved ones’ names. 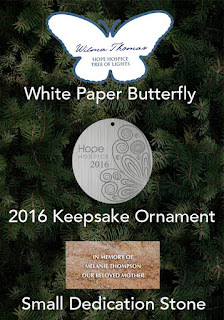 A gift of $25 ensures the placement of a personalized butterfly; with a gift of $50 or more, donors will also receive a 2016 metal keepsake ornament for their own tree. Ornaments may be purchased online at Donate.HopeHCS.org/TreeofLights or at the Hospice Houses’ front desks. At Hope, we know that living with loss is one of life’s greatest challenges - especially during the holidays. You and your family are welcome to join us as we come together in community, compassion and caring to celebrate the memory of our loved ones. You may bring a photo of your loved one to display during the service. Seating is limited. RSVP no later than December 5 by calling (877) 856-2449.